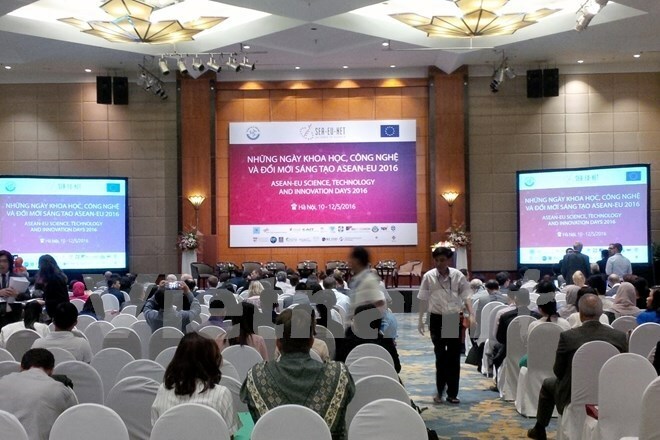 Hanoi (VNA) – The ASEAN-EU Science, Technology and Innovation Days (STI Days) kicked off in Hanoi on May 10, serving as a platform for scientists, policymakers and innovation companies from the two blocs to boost cooperation in the fields. The STI Days are held annually on a rotational basis between ASEAN and EU countries. This year’s event, which will last until May 12, is the third to be held so far. It is organised within the framework of the SEA-EU-NET 2 project, funded by the EU Commission’s seventh Framework Programme (FP7), to provide flexible and dynamic forums along with other events on science, technology and innovation. At the opening ceremony, Vietnamese Deputy Minister of Science and Technology Tran Viet Thanh said the SEA-EU-NET is a project to enhance scientific cooperation in areas that both ASEAN and the EU are interested in. Under the FP7 and Horizon 2020, an EU research and innovation programme, more than 200 Southeast Asian research organisations have engaged in joint research projects that aim to address global pressing issues such as environmental protection, health care, disease prevention, food safety, water resources management, and new energy. There is great potential for the two regions to further cooperation, especially in the field of innovation, he added. The 2016 STI Days are expected to feature 15 workshops attended by nearly 600 delegates from over 40 countries, along with 24 exhibition booths of 10 nations.